Yeah, It's a Dirty Job . . . but somebody has to do it! | Blackwell's Inc.
Yeah, It’s a Dirty Job . . . but somebody has to do it! With the exception of Mike Rowe of the Discovery Channel's tv program "Dirty Jobs" most people would go out of their way to avoid some of the dirty, oily, dangerous jobs we do, but that's what makes us successful. It all started back in 1982. Back then we were known as Blackwell's Chimney Sweep Service. We have the tophat nicely displayed in our office to prove it. And then we added pressure washing as an additional service. using proper confined space procedures. Over time, things have changed, and we have changed, too. We no longer do chimneys (at least not in the tophat, anyway). 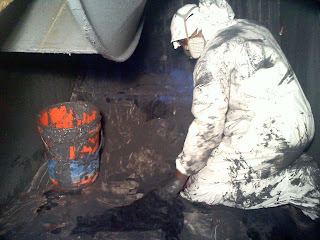 But we had the good fortune to use what we had learned cleaning chimneys and pressure washing and applied that to industrial cleaning projects. We now do specialty industrial cleaning for industries that do not have the trained personel to safely clean the ovens, tanks, vats, ductwork, fans, silos, ceilings, confined spaces, and other equipment that needs cleaning as part of the regular maintenance. We do it safely. We do it efficiently. And we do it cost competively.